It started out on a rainy day in January. Like the rest of overweight America, I had resurrected old New Year resolutions. I wandered into a branch of a not-to-be-identified weight loss program and approached a young lady sorting out pamphlets. After giving me the information I requested, she excitedly told me that I would also be able to access her blog, which she updated with helpful hints. She stopped, perusing my persona, and asked, “Do you know what a blog is?” Or said another way “You have white hair, which means you’re technologically illiterate.” I immediately felt furious. I responded in an icy tone, I have a blog. I think I saw her flinch, at least I hope I did. Our conversation went downhill from there. I ran through the rain back to my car, vowing not to join this group. I thought later, I wish I had the sense not to get so defensive. I had lost a teachable moment. In my past career as a gerontological nurse practitioner, I met many older people who transcended the stereotypes of aging. They showed me how they dealt with the complexities of old age—with humor and humility. Will I be ready to confront ageism with panache when it happens again? And I am sure it will happen again. How funny. Actually NOT. Glad you were able to show her you don’t fit her stereotype. 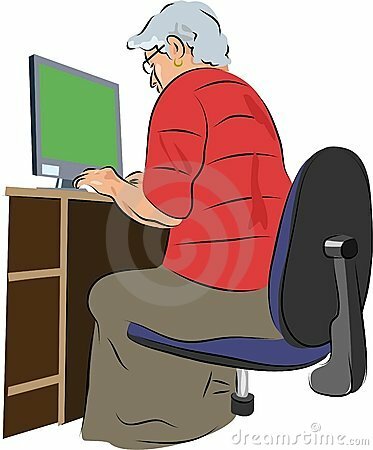 Is that really you at the computer??? Almost could be. I hope you will spread the word wide and far about your blog and how much fun you’re having in your life and your work–even with your white hair. Teach ’em Marianna. Go girl. Love the image at the computer. I wonder too. Is it you? No it’s not me but it could be when I was a few pounds heavier. As you know I lost a few pounds with no help from the not-to-be-named weight loss program. Ha!